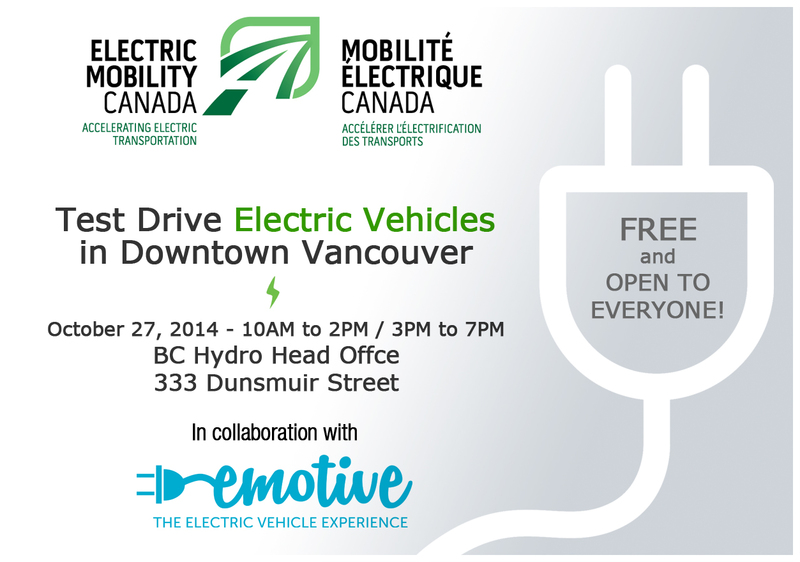 When: This year’s Ride N’ Drive will take place on Monday October 27, 2014 from 10:00 am to 2:00 pm and from 3:00 pm to 7:00 pm. Where: the event will take place at the BC Hydro Head Office located at 333 Dunsmuir Street located in downtown Vancouver. For whom: The event is aimed at the Vancouver region media as well as its citizens. Media promotion is organized by EMC’s media consultant, Rivers Edge Consulting of Vancouver. Media and public will meet in the lobby of BC Hydro and EVs will be operating from a cordoned off section of Homer Street adjacent to the office. Media inquiries can be directed to Debby Harris of Rivers Edge Consulting at debby@riversedgeconsulting.ca. Members of the public wishing to view and test drive electric vehicle can register using a valid driver’s license in the lobby of BC Hydro offices starting at 10:00 am on October 27.